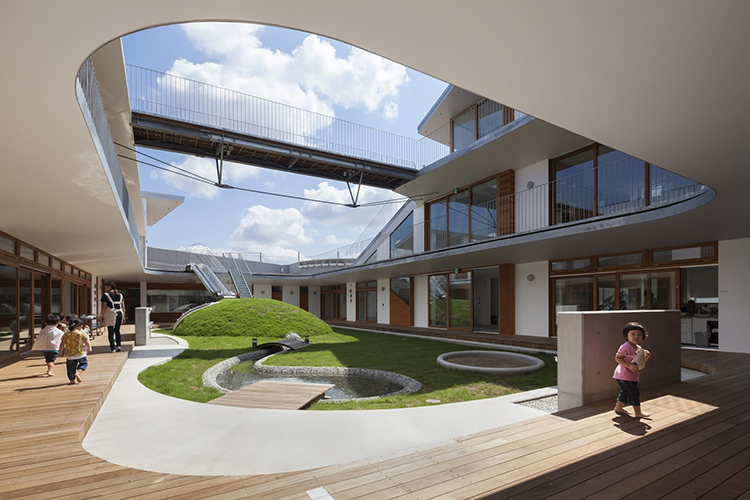 The three-storey Amenenomori Nursery designed by Aisaka Architects' Atelier in Japan, places "play" at its core - with a grassy "green" including mound, ponds with miniature wharfs over and a sandpit, ladder and slide connecting the ground with the terraced deck level above. Seen above, one side of the grassy mound features a climbing wall. 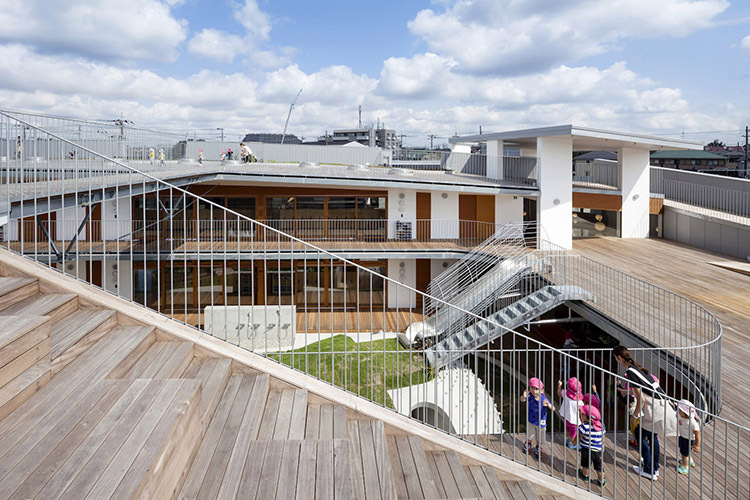 Administrative spaces are aligned along the centre's entry allowing views to the playground and ensuring visual surveillance. 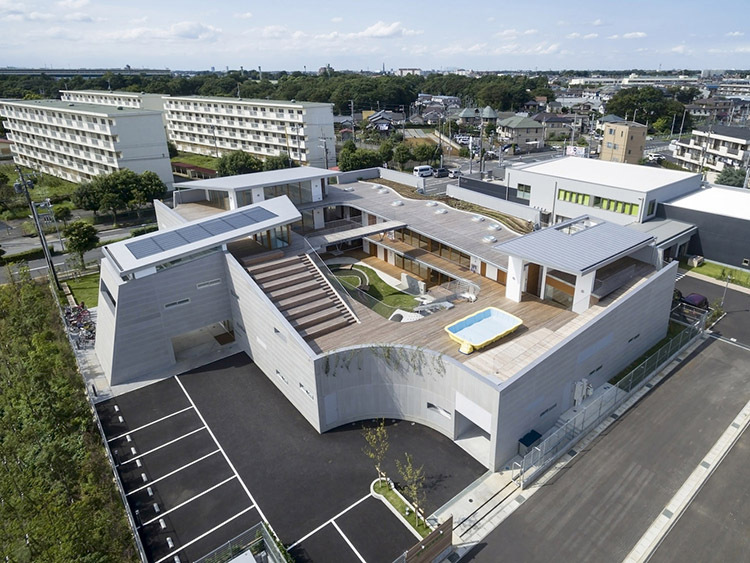 A key design characteristic is the fantastic decked rooftop and gardens, offering views over the inner courtyard play area and out to the surrounding neighbourhood. The architects chose to keep the material palette natural and minimal, opting instead to celebrate the essence of the material - the natural weathered patina of timber, the cold and unforgiving hardness of steel. 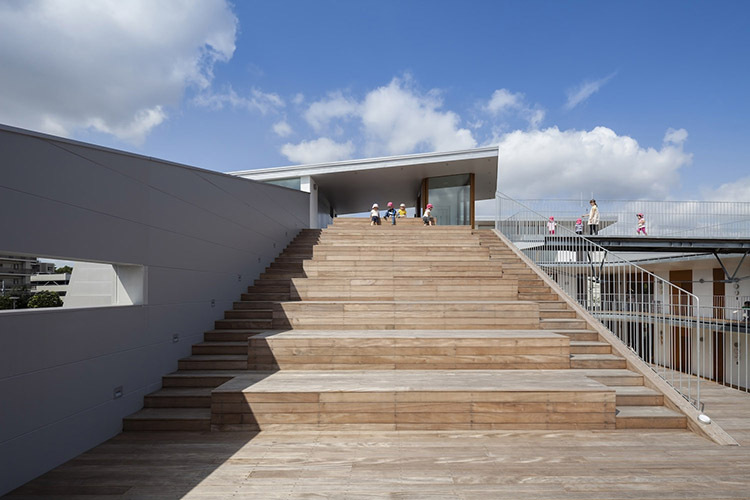 The Level 1 deck leads up to a Level 2 top-storey - with terraced steps leading up like a mountain. Internally, the neutral and minimal material palette continues. Ambient light, including natural light wells and narrow spaces offers natural cross-ventilation, creating a comfortable and healthy environment. Seen above left, light dances across the right wall leading from ground floor to the L2 roof above. 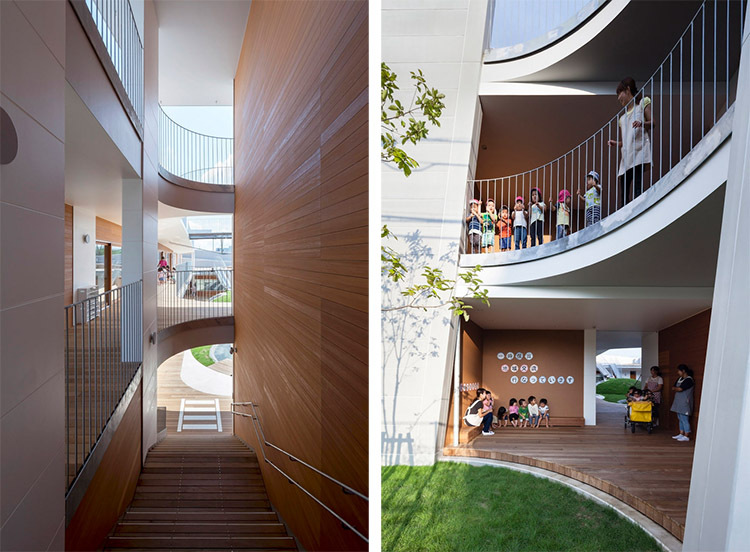 The design with its many decks, stairs, ramps and bridges and tilting, curving planes (floors and walls) allow for a multitude of spatial experiences. 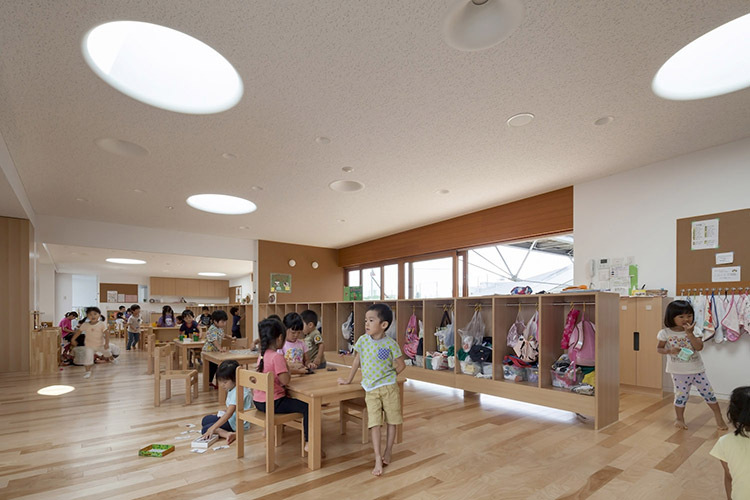 Meal times in early education & care in Japan play an important role in the day. 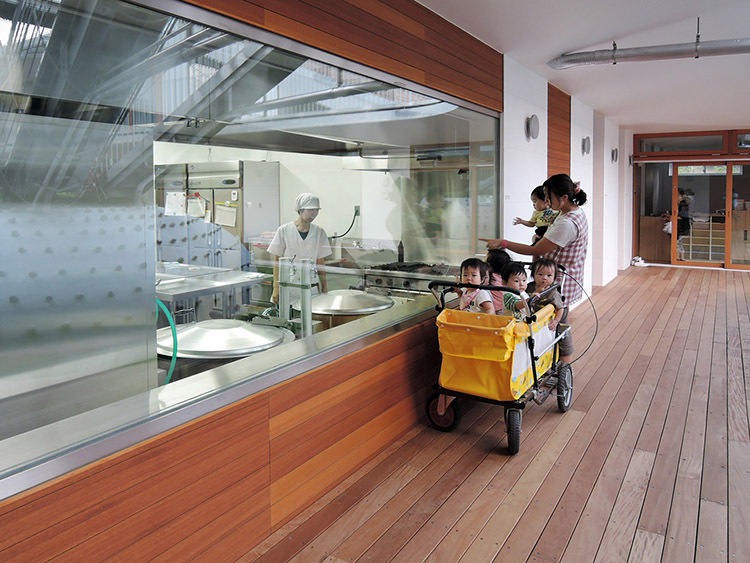 Seen above, a window set at the children's height allow them to witness how food is prepared. 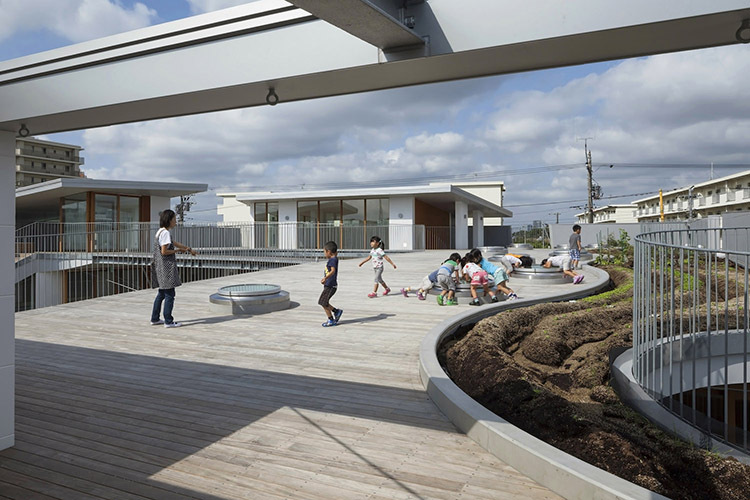 On the rooftop, a vegetable and herb garden teaches children about how food is produced (and grown). 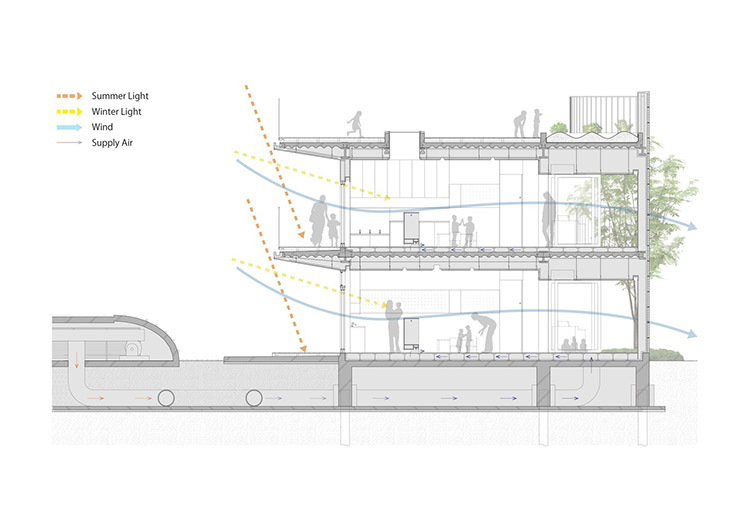 3D diagrams showing the concept - 1) Inner green 2) wrapping climbing floor around the inner green 3) external walls to cloak the interior with cuts allowing controlled exterior elements inside. Section through mound (on left) and the levels with rooftop terrace (decks and gardens) on top. 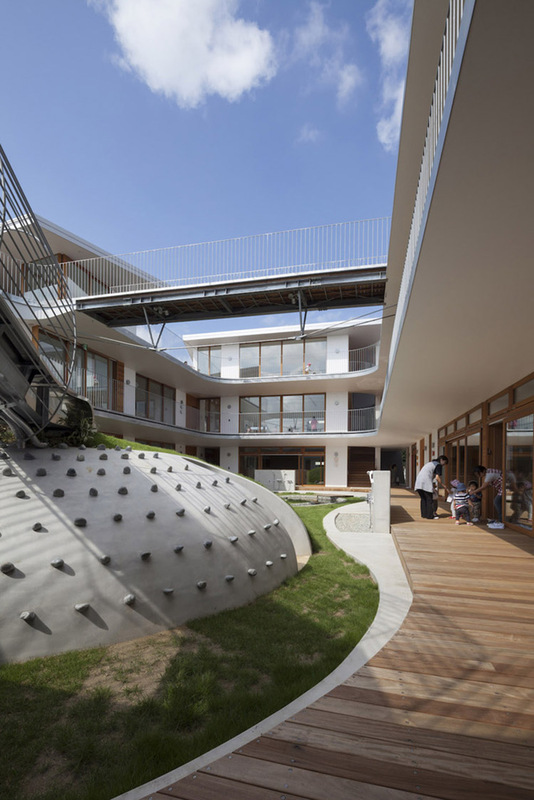 The architects integrated environmental principles into their design making the most of the natural sun, air (cross-ventilation), rain (with harvesting and recycling tanks), thermal (under-ground) heat storage and light (among others). 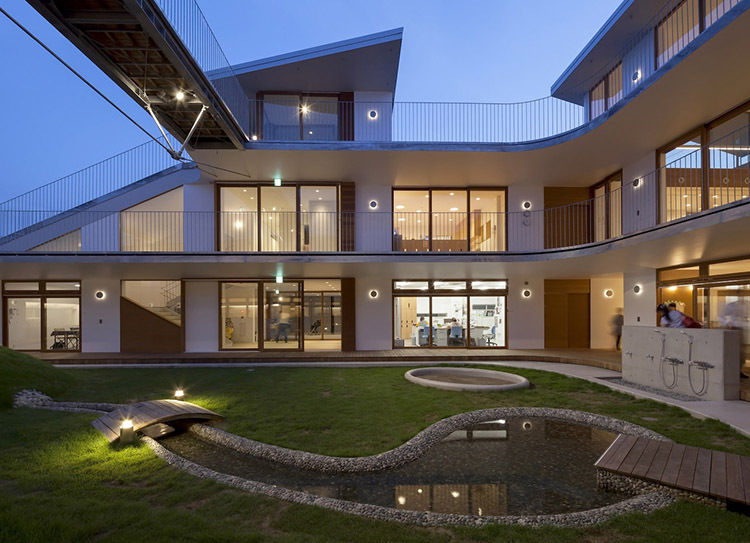 The architects (as often displayed in Japanese architecture) have at Amamenomori Nursery successfully utilised space. 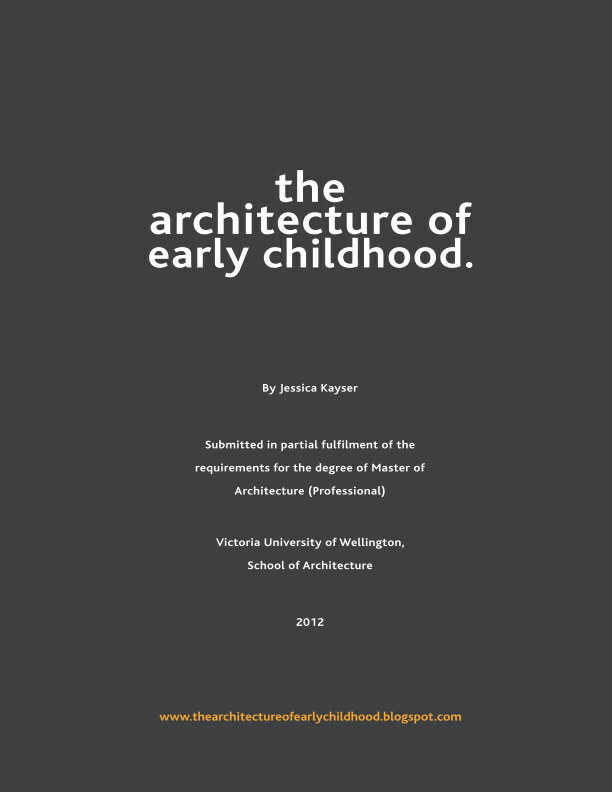 Maximising the potential for social connectivity / inclusion and in encouraging active exploration and physical movement, whilst also creating a safe and comfortable environment for the young children.